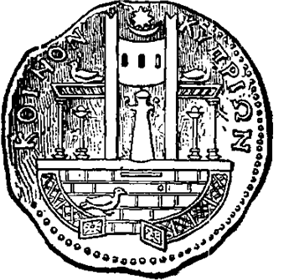 Koinon (Greek: Κοινόν, pl. Κοινά, Koina), meaning "common," in the sense of "public," had many interpretations, some societal, some governmental. The word was the neuter form of the adjective, roughly equivalent in the governmental sense to Latin res publica, "the public thing." Among the most frequent uses is "commonwealth," the government of a single state, such as the Athenian. Frequent in the historical writings was a sense of "league" or "federation" an association of distinct city-states. As government of a league, Koinon comprised such functions as defense, diplomacy, economics, and religious practices among its member states. The word was carried over to other political associations in mediaeval and modern Greek history. In Epirus itself there had in ancient times existed the Koinon of the Molossians. There was a Koinon of Laconians, centred on Sparta and its old dominions for a period under Roman rule, a Koinon of the Macedonians, also under Roman rule. In modern Greek history, during the Greek War of Independence, a local self-government termed Koinon was set up in the islands of Hydra, Spetsai and Psara. ^ The full range of meanings can be found under κοινός in LIddell & Scott. "A Greek-English Lexicon". ^ Mackil, Emily (May 18, 2013). Creating a Common Polity. University of California Press. p. 347. Retrieved October 21, 2014.